We have moved past the Information Age and are now living in the Imagination Age. Intuitive and creative thinking skills are as valuable as “hard skills” and are unique to each one of you. You have these innate skills—all you have to do is unleash them. Join up. What does imagination have to do with leadership? 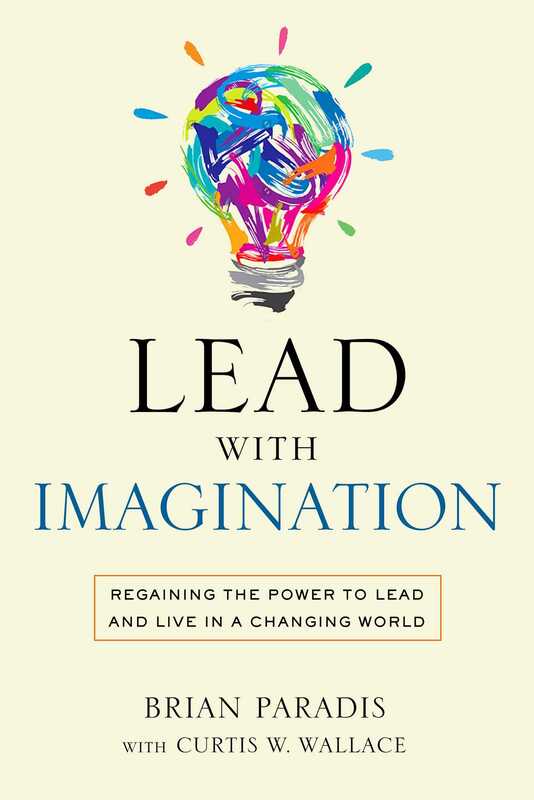 Ever since he was in college, Brian Paradis has been intrigued by the question, “What does imagination have to do with leadership?” For thirty years, he studied this puzzle as he honed his business and leadership skills, and one thing became crystal clear: imagination has a powerful influence on leadership. The compelling combination of leader + imagination = an opportunity to unleash all kinds of potential. The world is increasingly complex, knowledge is advancing at an unfathomable rate, and the problems in our world seem unsolvable. Organizations are in near constant and disruptive transition, and the cultures that define them are disconnected, disaffected, and divisive. Too many leaders show up to work wondering if any of it matters. We are “smarter” than any generation in history, but that isn’t the problem. The problem is imagination is not advancing at the same pace. But where there’s a closed door, there’s an open window of opportunity for those willing to walk through, to take a risk, and see what others don’t. You will be inspired by the possibilities and strengthened against the challenges. You will gain power and confidence to imagine, create, and innovate. We are all born with innate imagination and curiosity—learn how to use it. You will release your fullest potential and help release the potential of those you lead. We all learned as kindergarteners to assimilate quickly by giving the teacher (society) the desired answer, and to “fit in.” That colored our thinking from that moment forward and restricted our thinking and use of imagination. But now, it’s time to color outside the lines. Brian Paradis is a senior partner with CSuite Solutions, a national strategic advisory firm. CSuite Solutions is led by former healthcare industry CEOs focused on the transition and practical strategies to move the healthcare industry from “volume to value.” Previously, Paradis was president of Florida Hospital’s Central Region, a $4 billion enterprise with over 25,000 employees and 2,000 physicians. Under his leadership, Florida Hospital became the #1 ranked hospital in Florida by US News and World Report for three years. They also launched a new children’s hospital through an innovative collaboration with Walt Disney World to create an immersive patient experience. Paradis’s understanding of the role of imagination in organizational leadership helped develop a creative, results-oriented team based on a shared vision driven by a Strategic Innovation Agenda (SIA). He always asked: “How are we growing our business?”, “How are we making our product better?”, and “How are we building our teams capabilities?” Paradis serves his community by focusing on children, family health, and the arts. He earned a BA in business administration from Southern College, Chattanooga, TN, is a CPA, and is a Certified Management Accountant. He is married, father of five children, and the unexpected owner of three dogs.